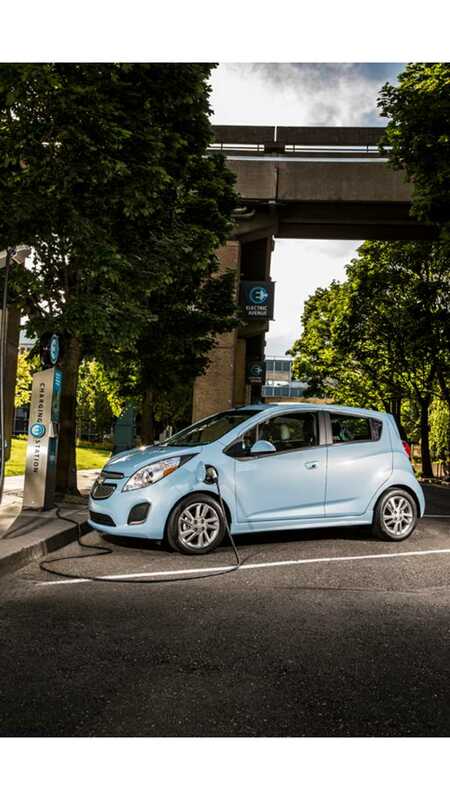 The electric smart fortwo and the Chevrolet Spark EV got the highest score in greenest vehicles list for 2016, assembled by the American Council for an Energy-Efficient Economy (ACEEE) for the 19th season. EVs were on top in previous years and every year they grab more spots. It seems the recipe for winning is to launch a small electric model like the smart ED, Spark EV or Fiat 500e. This year's edition was easier for most models as the Greenest List banned all cars related to DieselGate. 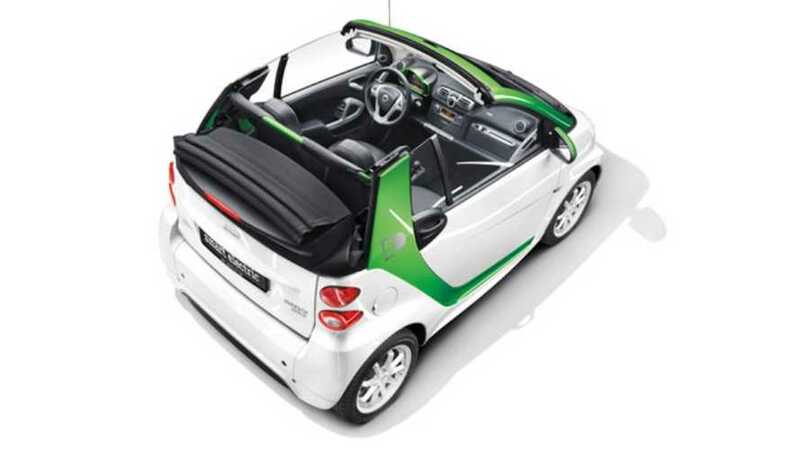 "The Smart ForTwo Electric Drive tops the Greenest List for the third year in a row with an unprecedented Green Score of 63. Toyota’s Prius line performs exceedingly well once again, with the new Prius Eco nabbing the 4th spot, while the Prius C and original Prius claim spots #8 and #9. For the first time ever, the Greenest list is completely populated by plug-in and hybrid vehicles; not a single vehicle with only an internal combustion engine appears. This is partly due to the disappearance from the American market of a few of the longstanding entries on the Greenest List, including the Honda Civic Natural Gas. However, the conventional Smart ForTwo and Chevrolet Spark hover just below the Volkswagen Jetta Hybrid." "The newest additions to the list are the Volkswagen eGolf and the Kia’s Soul electric vehicle, which claim the #5 and #7 spots respectively. This year marks the first time a Kia vehicle has earned a top spot since 2009. The improved 2016 Chevrolet Volt also nabs a spot this year (#11) thanks to significant increases in fuel economy and its new streamlined vehicle design. Once again this year, a diverse array of manufacturers are represented among the top 12 vehicles, including two American manufacturers. Modern clean diesels have repeatedly placed well in ACEEE’s annual rankings, only a few places away from the “Greenest” list. However, following the EPA announcement that Volkswagen has cheated federal emissions standards since 2009 with the use of defeat devices, greenercars.org suspended its Green Scores for all affected VW, Audi, and Porsche diesel models." 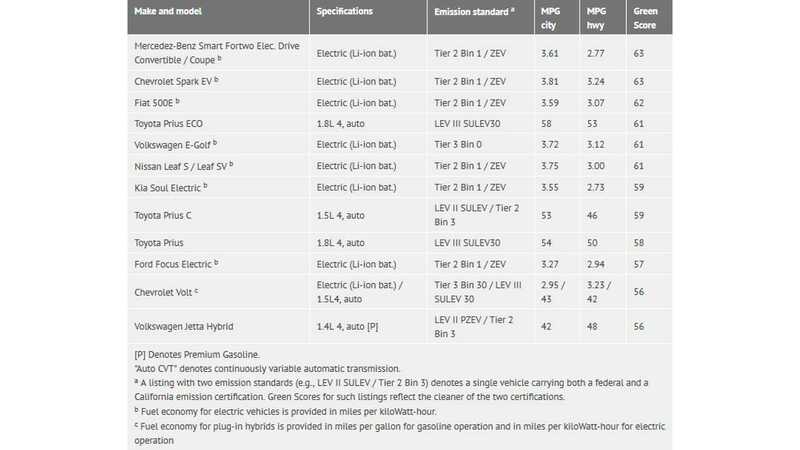 “The 2016 scores are in, and plug-in electric vehicles are outpacing all other vehicle offerings in terms of environmental friendliness. Fortunately, the electricity sector is slated to become cleaner over the life of model year 2016 vehicles, thanks to the Clean Power Plan, and that has bumped up electric vehicles’ green scores this year. Nevertheless, it’s important to acknowledge that how green your electric vehicle truly is depends on the electricity it uses to charge."